TED talks have redefined the elements of a successful presentation and become the gold standard for public speaking around the world. And yet the techniques that top TED speakers use are the same ones that will make any presentation more dynamic, fire up any team, and give anyone the confidence to overcome their fear of public speaking. 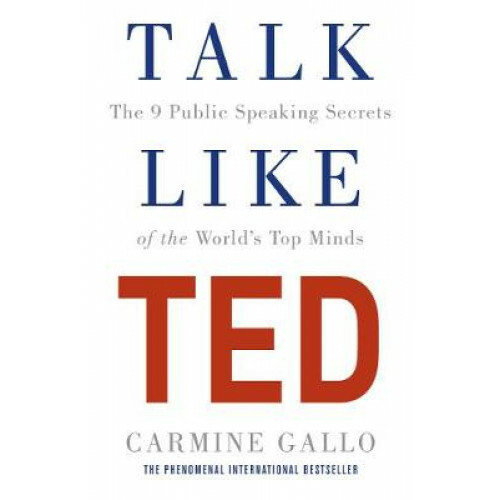 Communications coach and bestselling author of The Presentation Secrets of Steve Jobs, Carmine Gallo has broken down the top TED talks and interviewed the most popular TED presenters to uncover the nine secrets of all successful TED presentations. From 'Unleashing the Master Within' and 'Delivering Jaw Dropping Moments' to 'Sticking to the 18-minute Rule' Gallo provides a step-by-step method that makes it possible for anyone to create, design, and deliver a TED-style presentation that is engaging, persuasive, and memorable. Ideas are the true currency of the 21st century, and Talk Like TED gives readers a way to create presentations around the ideas that matter most to them, presentations that will energize their audiences to spread those ideas, launch new initiatives, and reach their highest goals. Carmine Gallo, bestselling author of The Presentation Secrets of Steve Jobs, is the communications coach for some of the world's most admired brands. A former anchor and correspondent for CNN and CBS, Gallo is a popular keynote speaker who has worked with executives at Intel, Cisco, Chevron, Hewlett-Packard, Coca-Cola, Pfizer, and many others and writes the Forbes online column 'My Communications Coach'. He is also the author of The Storyteller's Secret, also published by Macmillan. He lives in Pleasanton, CA, with his wife and two daughters.